Verse 1. In the second year. Cf. Introduction. The prophet dates all his prophecies, as though he kept a strict diary of all the important events in the rebuilding of the Temple. First day of the month. The new moon was a time when the people assembled for worship (as do orthodox Jews today); thus it was an appropriate occasion for the preaching of Haggai's divine message. Sixth month. Called Elul, this month falls about September. The dating of the prophecy in the reign of a Gentile monarch is eloquent testimony that "the times of the Gentiles" had begun. The problem which Haggai is called to correct is that work on God's house, the Second Jewish Temple had stopped. Most of the real work of the Lord is without fanfare. The Bible predicted that the greatest worker of all time would not use fanfare as His tool to accomplishment. The spectacular time would come latter when a future Darius as a representative of the future Gentiles would have to step aside, or be wiped away for the sake of Israel. The time was not now, but preparation for that time was now! The Temple was critical to all God had planned for Israel and the Gentile World. This Second Temple at this time was not going to be spectacular, but it was still just as critical. It was critical to the judgment of the Gentiles by God's Servant who was to come. Darius was the third Persian King in a line of Gentile rule that was predicted by the prophet Daniel. 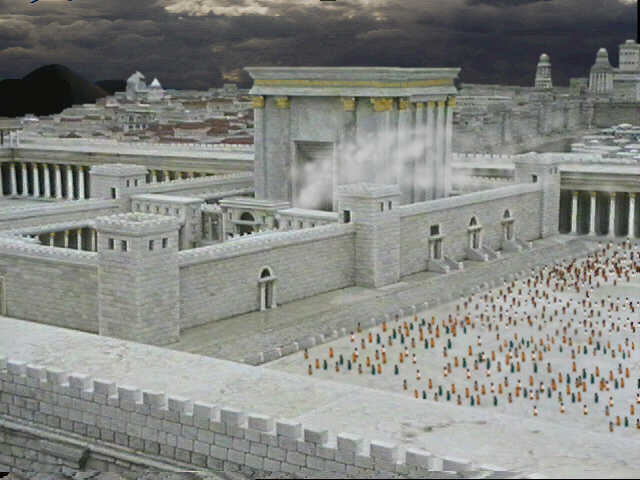 The Kingdom of God and of heaven to which Daniel said was "certain" must have the Jewish Temple. The law of that Kingdom will be the law of what the blood of Christ represents. The blood will lawfully be presented to the Jew first, and then to the world from the Temple! Nebuchadnezzar the head of gold, and the first of the Gentile rulers saw the truth in what Daniel said. He clearly saw God's plan in Christ that would end Gentile rule. A new Kingdom would emerge based on righteousness. It's Jewish Messiah/King would be better then anything the world could ever produce. He would be worthy for all other Kings and Kingdoms to step aside and yield. He will be irresistible to Jew and Gentile. He will crush and consume all who will not stand aside, who will not yield. "The word of Jehovah," "The word of the LORD," The word of Yahweh" is a repeated phrase throughout this short book. Today is the day of the usurper, the false prophet, the phony TV Charismatic making grandiose claims as spokesman and spokeswoman of God. A Biblically ignorant public has accepted these TV actors as a valid voice representing God. These false prophets have deceived their followers into believing everything they say and do is directly from God. Here, in Haggai, is the real voice of the real God of the Bible. God did not go to the big shots. He did not go to the great manipulators of the day. He went to Haggai. Many commentators have noted that Haggai's use of language is crude. He was not a very sophisticated fellow. He was the fellow God called as the first to speak after the dismal failure and expulsion of Israel. He was the first prophet of the first return. "Came by Haggai the prophet" God placed the word, the responsibility of representing God and His word, in the hand of Haggai. It was given to him to be the representative of the true God of the Bible. He did not have to be sophisticated. He did not need to be spectacular. All he had to do was be faithful. The name Haggai means "festive". It links him to the festivals of Israel. Here on the first day of the month the New Moon festival would have been celebrated. The place from where the trumpet was to be blown was on the Temple wall. Modern archeology has discovered the very Temple stone from in front of where the trumpet was blown. It is inscribed "To the trumpet-call building to pr..." At this point the stone is broken. It is believed to have said "To the trumpet-call building to pr[oclaim].". God called His people together at each new moon to acknowledge His rule over the nation. The Temple, the feasts, the sovereignty of God are all coming back together under the prophet Haggai at this first return, and are similarly coming together again at this second return of our day. This first message of Haggai is directed to two very prominent Jews. The first is Zerubbabel the governor. He was the secular head of Israel at the time. He was the city planner as it were. He determined what and where things would be built. He was the head administrator. He issued the building permits. He determined the priorities of all the public buildings. Zerubbabel - His name means "born or begotten in Babylon." In the historical accounts he is called Sheshbazzar (see Ezra 1:8; 5:14,16). He was a scion of the Davidic dynasty, the grandson of Jehoiachin (Jeconiah; 1 Chron 3:17,19), and was made governor of Judah by Cyrus (Ezra 5:14). "Son of Shealtiel" There is a lot in a name in the Bible. Keil & Delitzsch did their homework. She'altii'eel, i.e., the prayer of God, or one asked of God in prayer, was, according to 1 Chron 3:17, if we take 'assiir as an appellative, a son of Jeconiah (Jehoiachin), or, if we take 'assiir as a proper name, a son of Assir the son of Jeconiah, and therefore a grandson of Jehoiachin. But, according to 1 Chron 3:19, Zerubbabel was a son of Pedaiah, a brother of Shealtiel. And lastly, according to the genealogy in Luke 3:27, Shealtiel was not a son of either Assir or Jeconiah, but of Neri, a descendant of David through his son Nathan. These three divergent accounts, according to which Zerubbabel was (1) a son of Shealtiël, (2) a son of Pedaiah, the brother of Shealtiël, and a grandson of Assir or Jeconiah, (3) a son of Shealtiël and grandson of Neri, may be brought into harmony by means of the following combinations, if we bear in mind the prophecy of Jeremiah (Jer 32:30), that Jeconiah would be childless, and not be blessed with having one of his seed sitting upon the throne of David and ruling over Judah. Since this prophecy of Jeremiah was fulfilled, according to the genealogical table given by Luke, inasmuch as Shealtiël's father there is not Assir or Jeconiah, a descendant of David in the line of Solomon, but Neri, a descendant of David's son Nathan, it follows that neither of the sons of Jeconiah mentioned in 1 Chron 3:17-18 (Zedekiah and Assir) had a son, but that the latter had only a daughter, who married a man of the family of her father's tribe, according to the law of the heiresses, Num 27:8; 36:8-9-namely Neri, who belonged to the tribe of Judah and family of David. From this marriage sprang Shealtiël, Malkiram, Pedaiah, and others. The eldest of these took possession of the property of his maternal grandfather, and was regarded in law as his (legitimate) son. Hence he is described in 1 Chron 3:17 as the son of Assir the son of Jeconiah, whereas in Luke he is described, according to his lineal descent, as the son of Neri. But Shealtiël also appears to have died without posterity, and simply to have left a widow, which necessitated a Levirate marriage on the part of one of the brothers (Deut 25:5-10; Matt 22:24-28). Shealtiël's second brother Pedaiah appears to have performed his duty, and to have begotten Zerubbabel and Shimei by this sister-in-law (1 Chron 3:19), the former of whom, Zerubbabel, was entered in the family register of the deceased uncle Shealtiël, passing as his (lawful) son and heir, and continuing his family. Koehler holds essentially the same views (see his comm. on Hag 2:23). The word for "governor" is most likely a Persian word giving him the authority of the Gentile power. Zerubbabel was pechâh, a Persian governor. The real meaning of this foreign word is still a disputed point. It was to Zerubbabel that the responsibility was given to physically build the Second Jewish Temple! The second prominent Jew Haggai was to address at God's request was Joshua the High Priest. he high priest Joshua (Yehooshua', in Ezra 3:2,8; 4:3, contracted into Yeeshuua') was a son of Jozadak, who had been carried away by the Chaldaeans to Babylon (1 Chr. 5:41), and a grandson of the high priest Seraiah, whom Nebuchadnezzar had caused to be executed at Riblah in the year 588, after the conquest of Jerusalem (2 Kings 25:18-21; Jer 52:24-27). Joshua (Jehovah saved) is in Hebrew what Jesus is in Greek. The plan of God is found even in the names used. He was the religious head of Israel at this first return. It was to Joshua that the responsibility was given to re-establish kosher (right - acceptable to God) worship in the Second Jewish Temple. Blood sacrifice had to be done lawfully, honorably, and be acceptable to God in this Second Temple as it was in the First Temple. Seventy long years had passed. Joshua was responsible to do it right! His heart had to be right. His cloths had to be right. His methods and moves had to all be right. His helpers had to all be supervised to do everything correctly. Error was not allowed on the Temple Mount. Purity and holiness in everything was the unbreakable rule of Temple worship and sacrifice. It is no wonder that God referred to both Zerubbabel and Joshua as His Two Olive Tress who would build and establish kosher worship in the Second Temple. There are another Two Olive Trees mentioned in the Bible. In fact, it is the only other reference to Two Olive Trees in all the Bible. It is the Two Witnesses of Revelation chapter 11. It is not surprising that these Two Olive Trees are mentioned within the context of another Temple. When John wrote this vision the Second Temple had been destroyed by the Roman General Titus. The Temple John measures must be future. It must be Ezekiel's Temple (Ezekiel 40 - 48) a Temple more magnificent than all that proceed it. A Temple waiting to be built at this the second return of Israel. These Two Olive Trees will build and establish kosher worship in this Third Jewish Temple! These Two Olive Trees will have 3 1/2 years to accomplish their ministry. They will witness to the fact that God has changed dispensations. A great change will have taken place. As big a change as the New Testament was to the Old Testament. Now the reverse happens to which these Two Olive Trees will witness and testify. A change back to the Old Testament. The Jews are back in the land! The next step can only be the building of a Third Jewish Temple. This is the task of these Two Olive Trees of Revelation. They will be the two anointed ones of Zechariah as were Zerubbabel and Joshua. They will have the same responsibility. They will make Haggai one of the most contemporary books in the Bible. The God of the Bible has many titles. One title He does not have is Allah. Here, He calls Himself the LORD Of Hosts. Yahweh of Hosts! The term is military, and signifies great power in war. A potentate to be feared should He decide to settle any matter with force. Haggai is reminded that though this be the era of the Gentile, and though Israel be small in comparison to the Gentile powers. Israel's God is the LORD of Hosts! Should He decide to intercede, the Gentile powers would succumb in short order. They were no match for the God of the Bible, the God of Israel. Their very existence hinged only on the longsuffering of God, and the fulfillment of His plan in Christ! That plan included Israel, Jerusalem, and the Temple. Missionaries and pastors find themselves overwhelmed in the world where they minister. Their voice is but nothing when compared to what the world says. The culture is always monstrous in every ministry. In America the voice is small compared to the radio, the TV, the movies, the newspapers, the magazines, the internet etc. etc. The era of Gentile power makes the man of God tremble in insignificants. Yet, it is the LORD of hosts whom we serve. They prosper only at His pleasure, and their prosperity is fleeting and worthless. False Christianity flourishes in this generation especially. The Apostate Church is growing in leaps and bounds. It thrives in this last era of Biblical ignorance where the most outlandish claims are made by the Apostates building the the greatest, false, Apostate Christian Church in history. The fastest growing arm of this Great Apostasy is the Charismatic element. They have high-jacked "born again" with the blessings of the Evangelicals so the apostasy of even this term has become Anathema, Maran-atha within Charismaticisma. 2. We have here the doom of the person described: "Let him be Anathema, Maran-atha, lie under the heaviest and most dreadful curse. Let him be separated from the people of God, from the favour of God, and delivered up to his final, irrevocable, and inexorable vengeance" Maran-atha is a Syriac phrase, and signifies The Lord cometh. That very Lord whom they do not love, to whom they are inwardly and really disaffected whatever outward profession they make, is coming to execute judgment. And to be exposed to his wrath, to be divided to his left hand, to be condemned by him, how dreadful! If he will destroy, who can save? Those who fall under his condemning sentence must perish, and that for ever. Note, Those who love not the Lord Jesus Christ must perish without remedy. The wrath of God abides on every one who believes not on the Son, John 3:36. And true faith in Christ will evermore be productive of sincere love to him. Those who love him not cannot be believers in him. The Charismatic of today who follows the likes of Benny Hinn or Pau Crouch are the same who followed the Bakkers who went before. They turn "born again" into a lie. They dishonor Christ with their lies. They have added false doctrine to the simple gospel. They are no better then the cults and denominations who went before them with another gospel. A gospel of Mary worship, of man centered goodness, of becoming gods, and here speaking gibberish as evidence. The simple gospel of Christ has been added to by these Anathema, Maran-athas. It is a new gospel designed for this last age of the Church. The one that the LORD of hosts says He would spew them from His mouth. Rev 3:16 - So then because thou art lukewarm, and neither cold nor hot, I will spue thee out of my mouth. They will be spued from God's mouth. It will be at the rapture when they will be spit out and left behind! What they did to "born again" will be their condemnation for all eternity. They never have been, nor ever will be part of the true Church. Those who were victimized came out when the truth was revealed. The rest stayed in loving the lie more then they loved Christ! It is all so true what the Bible says about this last generation of the Church age! We need to be reminded as much as those of the first return that the God we worship is the LORD of hosts. Our voice against this tide is small, but the God we represent is Great. He is not Allah. He is the LORD of hosts. Israel found itself in a very difficult situation. Globalization had occurred under Nebuchadnezzar at this first return. He had become the head of gold. All other nations including Israel had either yielded or succumbed to his power. It was a Gentile world, and would remain as such until the LORD of hosts changed it. The second Kingdom following Nebuchadnezzar was now in power. Israel would have to function within this new power stucture. They were understandably discouraged. When they did work on the Lord's house it was with a shovel in one hand and a sword in the other. The pressure from the world was to take care of yourself and survive. Do not be provocative to the powers that be. Go with the flow. Do not make waves. Building a Jewish House of God was a big wave in that globalized Gentile world. It is as big a wave today as globalization is reaching the same intensity as it was at that first return. It is going to take a Zerubbabel and Joshua to accomplish the same task today. It has not been 70 years, but 27 X 70 since a Jewish Temple stood on the same spot where Zerubbabel built the Second Temple. It will certainly need God to take control. The building plans are already laid in Ezekiel 40 - 48. The method of worship is already laid out in the Old Testament. What is needed are two sanctified men of God to rightly follow those plans. They will need special inspiration to do the job in a kosher way. It must be done right. It must be done with perfection. It will take a very special hand of God to accomplish such a task. Such a special hand of God is revealed in the New Testament. It is given to the Two Witnesses of Revelation chapter 11. I believe these are the modern equivalents of Zerubbabel and Joshua. They will stand against world globalization to build the LORD's house, and establish kosher worship within it. Only they could accomplish such a task.We wait today for their call. The true Church must be raptured first. We must step out of the way so God can change dispensations. Apostate Christianity will be left behind to menace these Jewish witnesses to the change. The era of the New Testament Church will end in God's eyes, and Israel will be His focus in this next dispensation. A Temple will be a necessity, and it will be the Two Witnesses who will be given the task of building it, and setting up kosher worship. They will stand against globalization, Apostate Christianity, and Secular Judaism. It will take a lot to get the job done. Discouragement will need to be overcome in this day of the second return as was needed to be overcome in the first. They will have only 3 1/2 years to finish their ministry, and make an end to their testimony. It will then be time for the beast to desecrate their work for the last half of the Tribulation when he declares himself as god. 4 The second woe is past; and, behold, the third woe cometh quickly. Go to message #2 - A Work in Progress!